A worker is pictured on an assembly line at Toyota's factory in Burnaston, in the UK. LONDON -- Toyota Motor Co. said it will invest 240 million pounds ($294 million) in its UK car plant to allow it to build vehicles on a new platform, helping to boost competitiveness and promote the use of locally-built components. 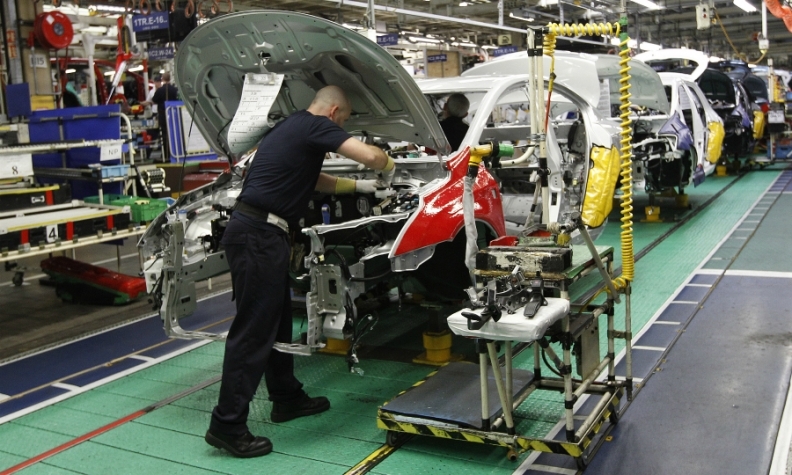 But the automaker, which currently builds its Auris hatchback and midsize Avensis car at its Burnaston plant in the north of England, warned that continued tariff-free access to the European single market remained crucial as Britain leaves the EU. "Our investment demonstrates that, as a company, we are doing all we can to raise the competitiveness of our Burnaston plant in Derbyshire," Johan van Zyl, Toyota's Europe chief, said. "Continued tariff-and-barrier free market access between the UK and Europe that is predictable and uncomplicated will be vital for future success." Earlier this month, Toyota said it may delay a decision on whether to build its next-generation Auris at the plant to see the outcome of Brexit negotiations. Toyota is due to end production of the current Auris model around the turn of the decade.